Plays, but didn't check that it records. Comes with the manual. The left side of the unit is sticky. Small Scratches on top of the unit. 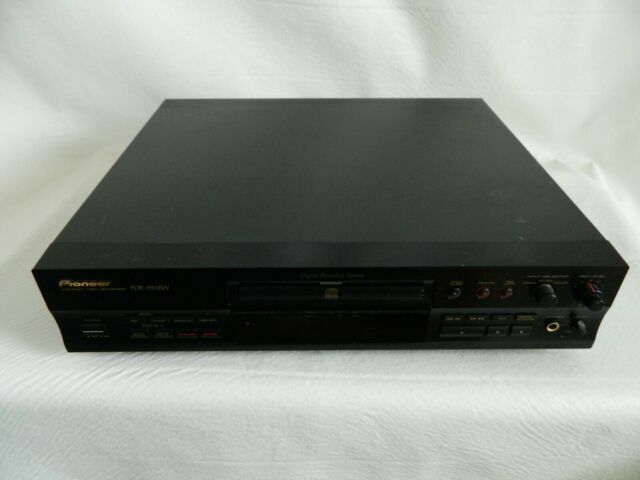 item 2 Pioneer PDR-555RW CD Compact Disc Recorder Tested w/ Remote & Free Shipping! -Pioneer PDR-555RW CD Compact Disc Recorder Tested w/ Remote & Free Shipping! item 4 Pioneer CD Compact Disc Recorder PDR-555RW with original remote control tested! -Pioneer CD Compact Disc Recorder PDR-555RW with original remote control tested! Now make recording CDs easy with the Pioneer PDR-555RW. The digital syncro-recording feature of this Pioneer CD recorder helps it to record as soon as it detects the sound and stop automatically at the end of the track. With a sampling frequency of 44.1kHz, this Pioneer media recorder gives you crystal clear sound quality. With three modes of erase, you have the flexibility to chose the mode you erase data with the Pioneer PDR-555RW. Now re-record up to 500 times with this Pioneer CD recorder. Make your life easy with this high performance Pioneer media recorder. Forget Using A Computer! This is NICE & EASY ! I've recently started collecting LP's and certain music I've been looking for cannot be found on the web, so browsing through thrift stores and checking out used vinyl has been the way to go for me. Then I wanted to take my LP's and burn them onto CD-ROM or MP-3 and this is the way to go. You have to go through too much on a computer to do such a simple task and this is NOT rocket science! I bought this baby used on Ebay and it is a great piece of equipment for recording LP's onto CD, and? If you have a good Stereo Equalizer (turntable to EQ in, EQ output to Audio In of the CD Burner) you can make some real magic with recording. I'm extremely pleased with the Pioneer and think it's a way better product than the Philips CD-recorder that I had that was short lived. Easy to use, recording can be tricky best if you have the owners manual which can be purchased reproduced. I see some buyers, some have info how to record & finalize & also check U-tube for more infos. Made well in the days that audio equipment was bitterly-build! Recommended! The unit seemed to be a good unit, but when it arrived it played CD's but did not record CD's. Some other people, by reading on the Net, have had issues with this unit, others have not. My issue is that the display shows the word CHECK blinking constantly when I press the record button. I am donating the unit to an orphanage. I will instead buy a brand new Teac recorder. Recorders seem like delicate machines that are better to buy brand new and not used. Live and learn.